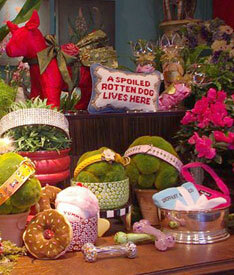 Pet boutique in the front and floral shop in the back, Tails of the City is darling on both ends. You’ll find rhinestone-studded collars worthy of Marie Antoinette’s lapdogs, and decorated dishes even the prissiest kitties will admire. Don’t forget to check out the affordable card selection with greetings for animal lovers and new-pet “announcement” packs, too. Think of Tails of the City as the Neiman Marcus of the pet world.